In my previous post, I discussed the importance of ideal posture as a foundational component of health and wellness. In this post, I will expand on ideal posture and how it relates to preventive therapy, health and wellness, and lay the foundation to understanding The Functional Wall Squat. The functional definition for posture is the starting point for body movement. As ideal posture is the most neutral, stress relieving position of the body, it is the also the optimal starting point for movement and function. Let’s examine the posture of the upper trunk. Upper Trunk Posture includes considerations for the position and orientation of the head, neck, shoulders, cervical spine, thoracic spine, the scapulae (shoulder blades), and the upper extremities (shoulders, elbows, wrists, and hands). For the upper trunk posture, the sagittal view (or side view) of the body is the most clinical interesting as it is in this view where the majority of one’s postural health is revealed in this region of the body. Neutral Head Tilt: Looking straight ahead is the best way to achieve neutral head tilt. Excessive downward or upward gazing can cause undue stress on the neck and spine. Typically we go where we look, so, look straight ahead! Doing this will protect your posture and achieve neutral head tilt. Cervical Spine Elongation: Imagine someone is pulling at the top of your head trying to make your spine longer. Neck Retraction (Chin Tuck): This is bringing the chin directly back so that the head is over the shoulders and not in front (as is shown in the “BAD” diagram). This is done while maintaining a neutral head tilt to avoid nodding or upward gazing. While this may be slightly redundant as cervical spine elongation naturally is accompanied with cervical retraction, this postural component is absolutely critical to upper trunk health. Thus, I double my efforts to reinforce this aspect of postural wellness. Thoracic Spine Extension: Sitting and Standing Tall is a natural way to cue the thoracic spine to extend, elongate, and avoid the flexed and hunched posture which gravity mercilessly influences us to conform to. A tall thoracic spine minimizes stress forces and is so important, it is usually the first order of business to prevent injuries from osteoporosis. Scapular Retraction: This is the act of bringing the shoulder blades together as if you are pinching them together. 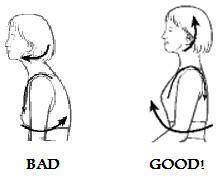 This requires for the muscles of the Rhomboids, Middle Trapezius, and Lower Trapezius to co-contract to put the shoulder blades in ideal posture. Caution: The Rhomboids are also downward rotators of the scapula and can be a contributing factor to rotator cuff impingement. A muscular balance must be emphasized to achieve ideal posture of the scapulae. Relaxed Upper Extremities: Many people carry stress in their shoulders and arms. In doing so, the shoulders are typically elevated and the arms are in a gripped and/or flexed position. The increase of tone in these muscles naturally lead to increased tone throughout the body which can cause poor posture, muscle cramps, trigger points, and other impairments which can be quickly resolved with Kettlebell Therapy. Coming up: Breaking Down The Functional Wall Squat (Part 3). In my next post, I will expand on ideal posture as the foundation for The Functional Wall Squat and discuss Lower Trunk and Lower Quarter Posture in detail.